What is Product Stewardship otherwise known as Extended Producer Responsibility (EPR)? Product Stewardship is the ability of a product maker to take back materials or items that they have used to produce their product as a way to manage the waste from that product. It is a shift in the mindset to manage products from start to finish.We are no longer looking at materials with a cradle to grave outlook but more as a cradle to cradle outlook. What can we do with these products and waste materials when the consumer is done with them? Companies who take on this responsibility have to look at what markets are there for their products and packaging, how to fund the collection and management of the materials and how the program will function. More and more companies are looking at product stewardship as good business practices. In California, there is a group that promotes EPR as a way for business to grow in this state. The California Product Stewardship Council (www.calpsc.org) states that there are several economic benefits to EPR including: "reduced operating costs, creating secondary material markets, reduced disposal costs, energy savings, and the creation of green jobs." Businesses with EPR programs have the option to tailor the program to their own business model. These businesses are even beginning to think outside of the box and looking to their products and packaging to see what they can do to reduce their impact for future products and redesigning them with a reduction of materials already in mind. As with all programs, there is a cost to managing them. Currently tax payers and garbage rate payers pay the bulk of the cost of managing materials. The EPR system puts the cost back onto the business initially with it passed onto the consumer at the time of the purchase of the product. The systems eventually works out that the consumer pays for the life cycle of that product and may in turn make them think about the products they buy. Consumers are looking for more products with less chemicals, made from recycled content and can be easily managed. California has several EPR programs already in place including paint, mattresses, electronics, batteries, fluorescent lamps, pharmaceuticals, medical sharps and pesticides. For more information check out the Cal PSC website or the CalRecycle website at www.calrecycle.ca.gov. If you take a look at cities in the US that have banned plastic bags in favor of reusable options, you will see the most successful areas are in Southern California. What that means is that your commitment to use and reuse your reusable bags has become a benchmark that will inspire those areas of the country that are trying to catch up with our success! When you see the bigger picture it's even more apparent that we are onto something big. Communities around the world, from California to Chandigarh are saying no to disposable bags in favor of reusable alternatives. Zero Waste Communities has shared a lot of day-to-day tips with you through our blog on why and how to reduce your bag waste, and through your responses, we’ve seen amazing examples of participation and innovation. So now you might ask, how can we keep getting better? 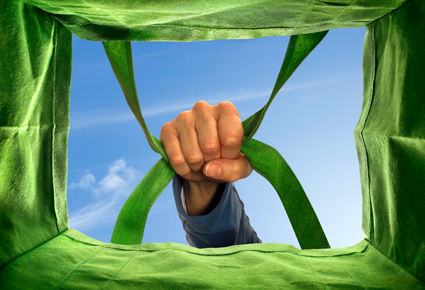 Well, the secret is that no matter which pieces of advice you take away, the best thing you can do to help the reusable bag movement at home and beyond is to be an active and proud advocate of reusable bags. Whether that means educating others about the downsides of disposable bags, the merits of reusable, or just showing off your own reusable bag collection at the market, we want you to be as proud of your accomplishments as we are and inspire others to join in along the way!